JPIDS is dedicated to perinatal, childhood, and adolescent infectious diseases. The journal, which was recently accepted into the Science Citation Index Expanded, publishes original research articles, clinical trial reports, guidelines, and topical reviews, with particular attention to global pediatric communities. Antibiotics are among the most commonly prescribed drugs used in human medicine and have saved countless lives. But misuse and overuse of these important medications accelerates the emergence of antibiotic-resistant bacteria, one of the biggest threats to global health. 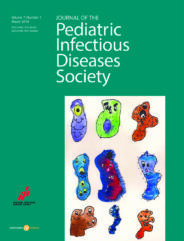 As experts who focus on this problem in children prepare for the Ninth Annual International Pediatric Antimicrobial Stewardship Conference, held from 31 May to 1 June, Dr. Theoklis Zaoutis, editor-in-chief of the Journal of the Pediatric Infectious Diseases Society, shared several insights on drug resistance and antibiotic use among children. How serious a threat is antibiotic resistance to the treatment of pediatric patients? Which drug-resistant infections are the most concerning right now? It’s a major problem. Antibiotic-resistant infections are associated with worse outcomes for our patients. Children infected with resistant types of bacteria have higher chances of dying, have more days in the hospital, and cost more to treat. The World Health Organization considers antibiotic resistance to be one of the three greatest threat to human health moving forward. The United Nations has called on all nations to develop plans to address it. The most concerning antibiotic-resistant infections right now are the multidrug-resistant Gram-negative infections (e.g., carbapenem-resistant Klebsiella and Pseudomonas, Acinetobacter). That’s where we’re seeing the majority of resistance. While we may have a few more available antibiotics for the treatment of drug-resistant Gram-positive infections, which are the other main type of antibiotic-resistant infection, we have very few drugs to treat multidrug-resistant Gram-negative infections. How can the improved use of antibiotics, through antibiotic stewardship, help address this threat? There are several core actions that can help prevent antibiotic resistance, including preventing infections in the first place through immunization, handwashing, food safety, and other means. However, it’s been pretty well established that the single most important factor in reducing drug resistance is changing how we use antibiotics. Approximately 50 percent of current antibiotic use is not necessary or appropriate. Antibiotic stewardship is really all about ensuring that antibiotics are used appropriately, meaning prescribing them only when they’re needed, utilizing the right antibiotic at the right dose and for the right duration. That’s what stewardship is: it’s essentially optimizing antibiotic use. The World Health Organization considers antibiotic resistance to be one of the three greatest threat to human health moving forward. What are some of the unique challenges that face antibiotic stewardship efforts targeting pediatric patients? There are some unique populations in pediatrics; premature babies, or neonates, is one I would highlight. They don’t manifest infections in the same way as most other patient populations, the signs of infection are much more non-specific. There’s also many fewer antibiotic options for neonates. We often don’t know how to dose antibiotics in premature neonates. What role can parents play in improving antibiotic prescribing and use among children? They have a major role. If you look at studies, what you find is that there is a perception among clinicians that parents want an antibiotic for their child or will get upset if they don’t get that antibiotic. In fact, often what you’ll find in those studies is a mismatch between what the doctor perceives and what the parent actually wants. What parents want is reassurance; they want someone to explain to them that this is a viral infection, and it’s going to take ten days to get better, for example. Or how long to wait before an antibiotic might be useful and what the dangers of a particular antibiotic are. Communication is a huge part of the parent-pediatrician relationship. Parents need to ask doctors, does my child really need this antibiotic? What is this going to do for my child? Is it going to change the outcome of their illness? How is it going to help them? Is it going to make them better quicker or prevent something bad from happening? The lack of new antibiotic drug development has been a concern for many years. Are there any signs of new antibiotic options for treating infections in children in the development pipeline? This is a financial issue, and the financial incentives, unfortunately, are not aligned. I think we’re beginning to see a glimmer of hope. There are people working to develop new drugs and efforts to more effectively incentivize companies to make new antibiotics. I think the most important thing for our pediatric patients is to push companies involved in antibiotic development to include children in their testing. Companies will often study new antibiotics primarily in adults, because that’s where the market is, for the most part. This leaves us without the dosing data we need to use these antibiotics safely in children, who metabolize drugs differently than adults. Featured image credit: Pills by StockSnap. CC0 via Pixabay. Dr. Theoklis Zaoutis is chief of the Division of Infectious Diseases at Children’s Hospital of Philadelphia (CHOP), where he is a professor of pediatrics. In addition, he serves as director of the Center for Pediatric Clinical Effectiveness Research at the CHOP Research Institute. Dr. Zaoutis is the editor-in-chief of the Journal of the Pediatric Infectious Diseases Society.